Le Bon Marché Rive Gauche gives carte blanche to Chiharu Shiota, the Japanese guest artist at the 56th Venice Biennale. Until February 18th, one hundred and fifty boats from all over the world, from all cultures and all sizes, are sailing in the department store. 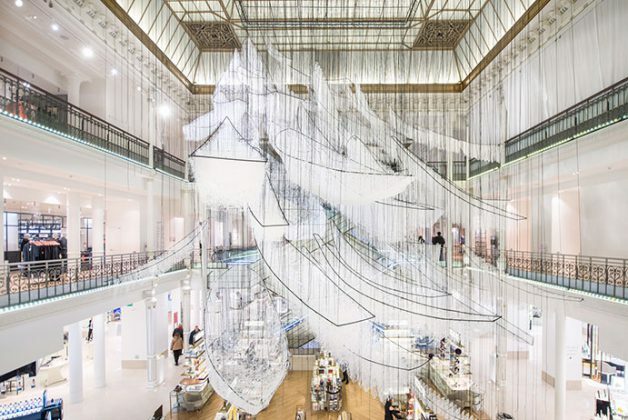 The metal hulls hollowed out – as drawn in pencil – are suspended under the central windows of the Bon Marché. Entitled “Where are we going? “The exhibition invites you to an unprecedented experience, to a new beginning and offers the opportunity to experience a moment of emotion inspired by her journey, the sea, the multiple interactions, real and metaphorical, that define each individual. Formed in Japan and then in Germany, Chiharu Shiota, initially introduced to painting and drawing, uses the thread as a pencil to draw in three dimensions. The weaving, the back and forth of the ball in the air, up to the density desired by the artist, are also a dance, a meditation, a performance.